Purdy’s Farmer and the Fish in North Salem, NY, offers unbeatable fresh and local ingredients, and an eye-catching mix of old and new. 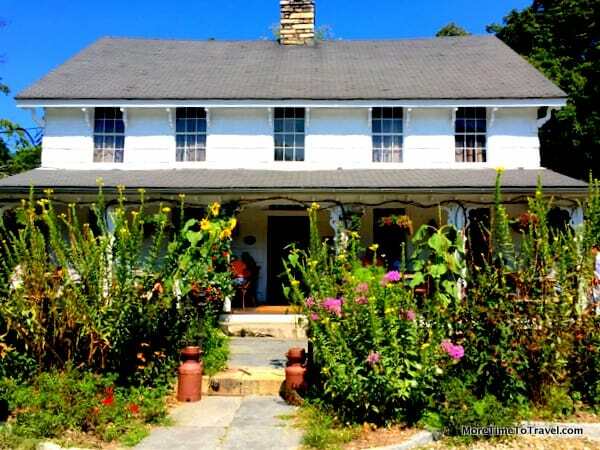 As your car pulls into the gravel driveway at the intersection of Routes 22 and 116 in Westchester County, New York, a shabby chic farmhouse with a welcoming front porch is tucked behind a hedge of summer wildflowers interspersed with tall black-eyed Susans. You might call the garden un-manicured but it’s obviously been tended with care. The setting for Purdy’s Farmer and the Fish in the town of North Salem could easily befit a country museum or antique shop. The wood framed, L-shaped, two-story house oozes charm. A plaque beside the front door dates it back to 1775. Inside, distressed wide-beam wooden floors reveal the warp of time. The structure, which was added to the National Historic Register in 1973, sits on the 22-acre Purdy Land Trust. When the restaurant opened about four years ago, the interior of the structure was gutted to create a wraparound space that includes dining tables, a raw bar, and cocktail bar with a giant Revolutionary-era fireplace at its center. (Note to self: This spot must be especially cozy in winter). When we arrived for lunch with friends on a sunny, summer day, every table was filled and the buzz in the room suggested everyone was happy. More diners spilled over to the outside porch. A friendly hostess showed us to our table. A mix of vintage photography, photos of locals, chalkboard menus and a large American flag decorate the old stone interior walls in the room. Black iron pedestal tables of different sizes and shapes are topped with slabs of white marble with small vases of fresh flowers. Oversized blue-and-white striped dish towels are at each place setting in lieu of napkins. The unusual name of the restaurant reflects the culinary genetics of its owners, a farmer and a fishmonger. Michael Kaphan, the executive chef, studied agriculture and oversees the adjacent two-acre farm that supplies three-quarters of the stock of vegetables and herbs used in the kitchen. His partner, Edward Taylor, owns a wholesale seafood company in the Bronx, and Fish, a restaurant in Greenwich Village. As one might expect from its name, the menu is highly seafood-centric but offers something to please every palate. In addition to an extensive list of seasonal oysters, diners can feast on fish, meats and poultry made over a grill or in the pan; salads; and house-made pastas that are made fresh daily. Everything is served a la minute. As a brunch appetizer, three in our party of four ordered the deliciously rich lobster and corn bisque. The sweet soup was served with moist chunks of lobster meat in the center. When we saw a waitress bring a Bacon Rib to the next table and couldn’t resist ordering one to taste among us. The mouth-watering rib, obtained from the belly of the pig, was deliciously seasoned with maple syrup and chili, served on a bed of fresh garden slaw with onion rings. Every other dish we ordered emphasized on fresh, local ingredients. The eclectic menu is original and varied enough that it leaves you begging to return to try something else. The 1½-pound lobster with steamers, creamers (potatoes) and sugar snaps was succulently moist and tender. My husband, Jerry, enjoyed the Jumbo Crab Cake Benedict, a seafood-take on traditional Eggs Benedict. Our friends ordered Seared Scallop Salad and Brioche French Toast. I always feel badly when a server asks you, “Are you enjoying your meal? — if the dish turns out to be lackluster. What do you say? In this case, we enthusiastically responded it was terrific, as was the service. We can’t wait to return. Located in the northernmost portion of the county, it’s well worth a day trip to the “country” (it’s about one hour from Manhattan) or a detour if you’re already traveling to Connecticut on nearby Route I-684. Open for Sunday brunch, lunch and dinner. Check the website for meal, Raw Bar, and Farm Shop hours. After your meal, be sure to stop in at the on-site Farm Shop featuring fresh produce from the farm, fish from the restaurant’s seafood supplier, and other local baked goods and specialty items. You are making my mouth water – this is a must try! Sounds – and looks – fabulous. Bacon rib?!?! I’d go just for that. Purdy’s looks like they know a thing or two about food and cooking. If we’re ever in that neck of the woods we’ll look them up. The decor of Purdy’s Farm and Fish is very inviting. And your photos of the food have my mouth watering. Looks like a great place to go for a meal. Nice! Nothing like fresh breads, but the Jumbo Crab Cake Benedict would be my choice. Love the surroundings! Sounds like a heavenly place! You write describe little details awfully well, making me feel part of the meal with you four! This place looks absolutely charming — and food sounds marvelous. Makes me want to head out for a visit this fall! Purdy’s sounds wonderful. I’d love to try that corn chowder. I don’t even know where to start with the yumminess of this post! Dinner on the front porch, definitely. Then bring me that basket of breads and some corn chowder, and after that I’ll have the bacon rib and seared scallop salad. Purdy’s is too delicious! That bacon and rib made my mouth water. And lobster- miss that living in the desert. If we still lived in NY we’d eat at Purdy’s in a heartbeat. We used to take Sunday drives on Route 22 sometimes.